In addition, the proposals would reduce state tax revenue and take hundreds of millions of dollars out of the state budget. 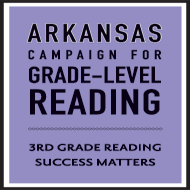 When you factor in the cuts to the budget that such a large reduction in revenue would necessitate, the task force’s own consultant reported that Arkansas’s economic productivity would decline if all their recommendations were in place. Background: Who Pays Taxes in Arkansas? A good tax system is fair, in that it is based on a family’s ability to pay. A good tax system is also adequate; that is, it can generate enough revenue to support vital state programs and services. As a whole, these recommendations do not address the goals set forth for the task force and fall short on the principles of adequacy and fairness that are necessary for a well-functioning state tax system. 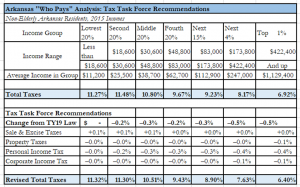 But to understand how the Task Force’s final recommendations address these goals, it’s necessary to understand how taxes are distributed across income groups in Arkansas right now. Arkansas’s tax system is currently regressive. That means as your income goes up, a smaller share of that income goes to state and local taxes. 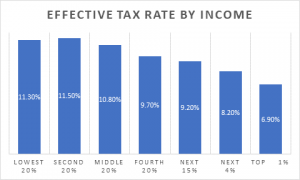 According to an analysis by the Institute of Taxation and Economic Policy (ITEP), low-income and middle-income families pay much more in state and local taxes as a share of their income than upper-income taxpayers. The bottom 20 percent – Arkansans making less than $18,600 a year – pay more than 11 percent of their income in state and local taxes. The top 1 percent of taxpayers in Arkansas – those making more than $422,400 – pay less than 7 percent of their income to state and local governments. Arkansas’s high reliance on a sales tax that includes necessities like groceries is the most regressive feature of the state tax code. 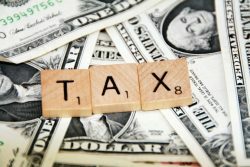 The progressive nature of the state income tax fails to make up for the highly regressive sales taxes, partially due to the favorable tax treatment for capital gains income. Capital gains are profits from the sale of a capital asset, such as shares of stock or land. In Arkansas, 50 percent of capital gains income is excluded from taxes, and all capital gains over $10 million are totally tax exempt. Taxing capital gains income at a lower rate than earned income is regressive because the majority of capital gains income goes to the wealthiest Arkansans. Although the Task Force’s final recommendations touched on four major areas of Arkansas tax policy – personal income taxes, corporate income taxes, sales taxes, and property taxes – the major focus and impact of the recommendations is on personal income tax cuts. 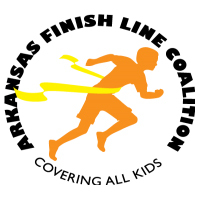 While different proposals for personal income taxes were considered, the tax task force ultimately voted to go with what they referred to as “Option A.” While nearly every state that taxes personal income has a progressive income tax structure to some degree– where your tax rate goes up as your earned income goes up – only Arkansas has rate schedules that vary by income. Option A would bring every Arkansan taxpayer back onto the same rate schedule, which brings us in conformity with the rest of the states and should be easier for state agencies to administer. This represents a modest income tax cut for some taxpayers earning more than $21,000 in annual income. The previous rate schedules had them paying a higher rate on the first $20,999 they earned. However, the element of Option A that has the biggest impact is reducing the top income tax rate from 6.9 percent to 6.5 percent. This is a much more substantial tax cut that only accrues to taxpayers with more than $80,000 in annual income. To balance this reduction in revenue, the task force has also recommended ending the exemption on capital gains income over $10 million dollars (capital gains over $10 million are currently untaxed). But ending this exemption would raise less than $5 million in annual revenue for the state, while the rate cuts will cost more than $275 million in lost annual revenue. Combined, 51 percent of Arkansas taxpayers overall would see some reduction in their tax burden due to these personal income tax changes. But almost 70 percent of the total income cut would go to the top 20 percent of taxpayers while the bottom 20 percent of taxpayers will see no tax cut at all. 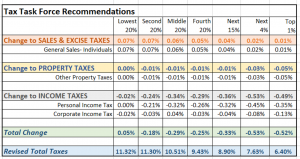 The most difficult tax force recommendations to understand are the modifications to our corporate income taxes. The nominal rate changes they have proposed are straightforward. The tax force proposes reducing the corporate tax rate from 6 percent to 5.9 percent for corporate profits between $25,001 and $100,000 a year, and from 6.5 percent to 5.9 percent on income exceeding $100,000. However, there are also changes to the process through which we determine how much of a multi-state corporation’s profits are subject to Arkansas taxes. This process, known as “apportionment,” is an attempt to estimate how much of a company’s activities occur in each state to calculate the share of profits that are subject to Arkansas state taxes. Under current law, Arkansas’s “apportionment” formula takes the total amount of sales a company makes, the total amount of property it owns, and the total amount it pays its employees, and then calculates the percentage of each of those activities that takes place in our state. These percentages are then used to determine the share of corporate profits that are subject to Arkansas taxes. 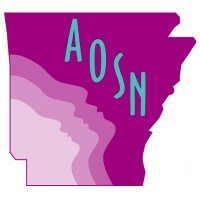 The task force recommended two major changes to this apportionment process in Arkansas; first, they recommend Arkansas change our formula to be based on a “Single Sales Factor” rather than including information on corporate property and payroll in the apportionment calculation. Most states, including Arkansas, use what is known as the ‘destination rule’ in determining where to assign a sale for apportionment purposes. For instance, if a Tennessee business manufactures a machine and sells it to a customer in Arkansas, this sale counts towards that business’s total Arkansas sales, and does not count toward its Tennessee sales. The second and related proposal would repeal our “throwback rule,” which is intended to ensure that all corporate profits are subject to taxation in at least one jurisdiction. Sometimes when a seller from one state makes sales into another, they are not subject to taxes in either location. This problem is exacerbated by the change to single sales factor apportionment. For example, if a business manufactures a machine in a state that has a corporate tax and sells that machine to a customer in a state without a corporate tax, neither state would be able to claim that sale for the purposes of their apportionment formula for that business. To deal with this problem, many states created a “throwback rule,” where that sale would be “thrown back” to the state of origin and would be taxed in the origin state. Proponents argue that the throwback rule is complicated to administer and deal with, for both state agencies and businesses themselves, which thus makes Arkansas less competitive from a business standpoint. 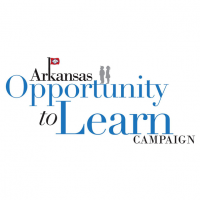 But when repeal of the throwback rule is combined with the change in the apportionment process to a single sales factor, the vast majority of the tax benefits would accrue to corporations outside of Arkansas according to an ITEP analysis of the tax force recommendations. Moreover, the Arkansans who would benefit from a cut to corporate taxes are those at the highest income levels. An extensive evaluation by the non-partisan Joint Committee on Taxation found that the benefits of corporate tax rate cuts mainly go to wealthy shareholders, not workers. The net impact of these changes in personal and corporate income taxes would be to make Arkansas’s tax system even more unfair. While none of the income tax proposals would result in a net increase in taxes for taxpayers in any bracket, the benefits largely accrue to the very highest income-earners in Arkansas. The top 1 percent, those making more than $422,400 a year, would see two times the tax cut of those making between $18,600 and $30,600 as a share of their income. 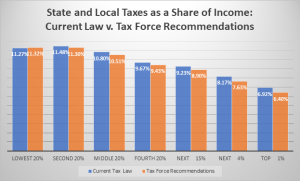 With respect to sales taxes, the task force recommendations generally attempt to broaden the sales tax base and reduce administrative complexity. For example, they are recommending eliminating the sales tax exemption for specific named nonprofit entities and replacing this with a generalized sales tax exemption for nonprofits. They also recommend ending certain sales tax exemptions for ATVs and four-wheelers and for subscription sales of publications other than newspapers. But the biggest piece of sales tax reform is the recommendation to require out-of-state-sellers without a physical presence in the state and who have more than $100,000 in sales or at least 200 sales transactions in Arkansas to collect and remit back to the State of Arkansas any sales and use taxes owed by Arkansas residents on the purchases they make. These taxes are already owed under current state law, but the responsibility for tracking and filing them falls on consumers. This provision, sometimes referred to as an “internet sales tax,” would raise roughly $35 million in revenue ($24 million of which would be available for general revenue). Unlike the combined proposals for corporate and personal income taxes, the sales tax proposals are revenue raisers for the state. Because people with low and moderate incomes are more likely to spend a higher share of their income on consumption, they are more likely to spend a greater share of their income on sales taxes. Accordingly, these sales tax increases would impact all Arkansans, but especially those making less than $48,800 a year. There are some elements of the tax reform package that are sorely needed to modernize our state tax system and bring us into the 21st century. And there are some modifications that make it more efficient for taxes to be reported and collected administratively. Moreover, the major loss of revenue from these proposed tax cuts needs to be addressed directly by this legislature. If all of the task force recommendations were implemented, state revenue would decrease by at least $350 million annually, representing an almost 10 percent cut to the state general revenue budget. Relying on tax triggers simply hits the pause button on the conversation and requires the tough choices about what programs to cut to be made by someone else in the future. We need to deal with these issues before we enact any major tax cuts – not after. Merge our three tax tables into one, putting us back in conformity with every other state tax system. Repeal of the ‘throwback rule’ for multi-state business income. Use ‘single sales factor’ apportionment formula for taxing multi-state business income. The combination of changes on multi-state business taxes would cost $57 million. Repeal the exemption for named nonprofit entities and replace with a generalized exemption for nonprofits. Places limits on local government authority to raise sales taxes.